Worksop Town boss Craig Denton said he was prepared to turn to the club’s younger players as suspensions took their toll. The Tigers will entertain Albion Sports on Saturday without the suspended Kyle Jordan, Michael Trench and Craig Mitchell. It is the Tigers last home match before Christmas as they then face three successive Saturday afternoons on their travels. Denton said: “We want as many players available as possible but I know that things get thrown at you. “If it’s not suspensions it’s injuries, if it’s not injuries it’s unavailability, holidays or work. “That’s part and parcel of being a manager at this level. Denton said he would be liaising with under-19 manager Aiden Spowage. “I go to a few of those games and that’s the sort of route we want to go down,” said Denton. The Tigers boss said it was unlikely that he would be signing fresh faces to boost his depleted ranks at Sandy Lane. “We’re not looking at recruiting anyone at the moment,” he said. Denton added that he was prepared to put his faith in his current squad, providing they were backing him and the club. 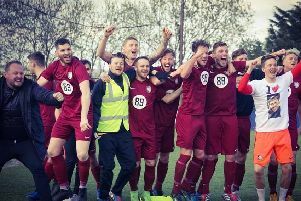 He was heartened by the performance in the terrific 1-0 win at Penistone Church, who are second in the Northern Counties East League, last Saturday. But Denton said he was not prepared to put up with sub-standard performances, such as the one in a recent 2-2 home draw against Barton that provoked an angry reaction from the manager. He said: “If players are performing then I’ll stick by that group. “If I have a performance like we did against Barton, I had a bit of a rage in a video after the game and said players would be replaced. “I think the players listened to that and repaid us with a performance we know they’re capable of.